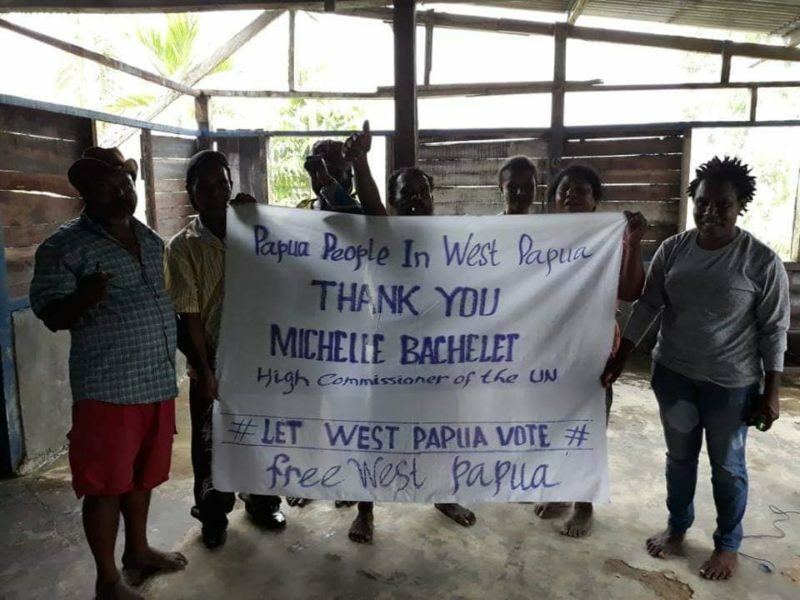 Today, the Office of the United Nations High Commissioner for Human Rights, confirmed that High Commissioner Michelle Bachelet received the West Papuan People’s Petition on Friday 25th January. We call on you to urgently address the human rights situation in West Papua and to review the UN’s involvement in the administration of West Papua that led to its unlawful annexation by Indonesia ‐- and the human rights abuse that continues today. We call upon you to: – appoint a Special Representative to investigate the human rights situation in West Papua; – put West Papua back on the Decolonisation Committee agenda and ensure our right to self‐determination – denied to us in 1969 – is respected by holding an Internationally Supervised Vote (in accordance with UN General Assembly Resolutions 1514 and 1541 (XV)). Ravina Shamdasani stated, “Indonesia has agreed to give our office access to visit West Papua and we are waiting for confirmation regarding the arrangement”. 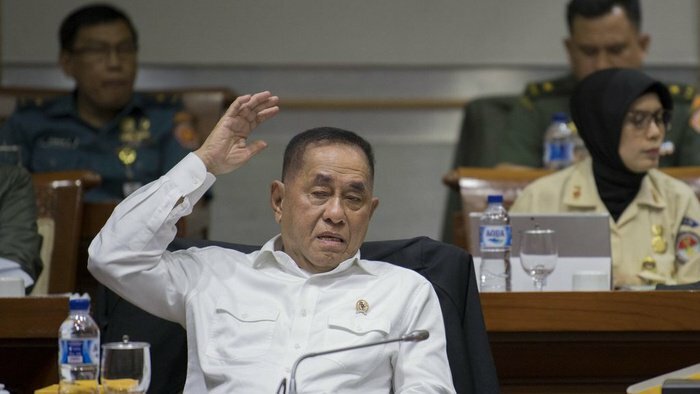 Within hours of its public announcement, the Indonesian government and the Indonesian military made several statements in anger at the petition being successfully delivered, and criticising the United Nations for receiving it. 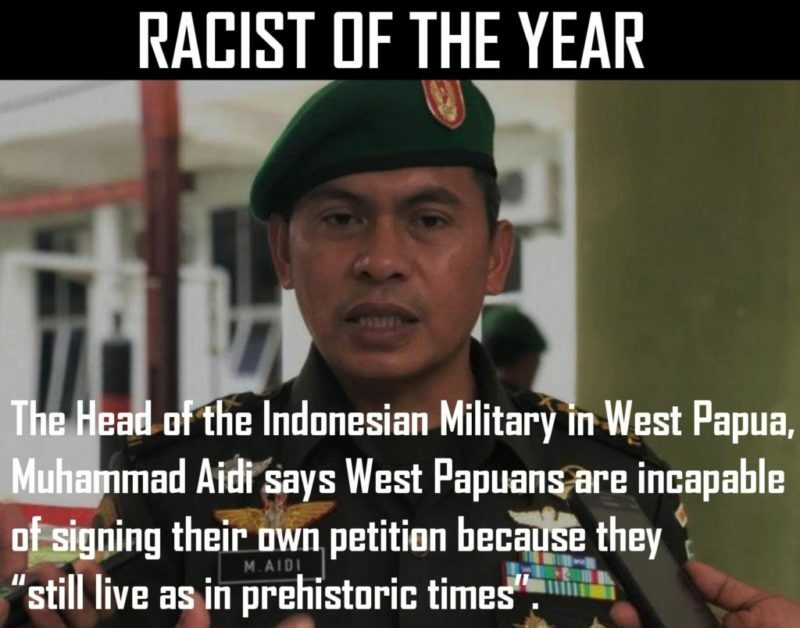 The Head of the Indonesian military in West Papua even denied that 1.8 million West Papuans had actually signed the petition, saying that much of the population “still live as in prehistorical times”. This is exactly the same claim that the Indonesian government made in 1969, asserting that West Papuans were “too primitive” to cope with a democratic vote. The Head of the Indonesian military in West Papua, Muhammad Aidi. Across West Papua, people celebrated the delivery of the petition to the UN High Commissioner for Human Rights. A gathering was held in which people held a banner reading “Papua people in West Papua thank you Michelle Bachelet, High Comissioner of the UN”. West Papuans in Merauke demonstrating to show their thanks to UN High Commissioner for receiving the West Papuan people’s petition. 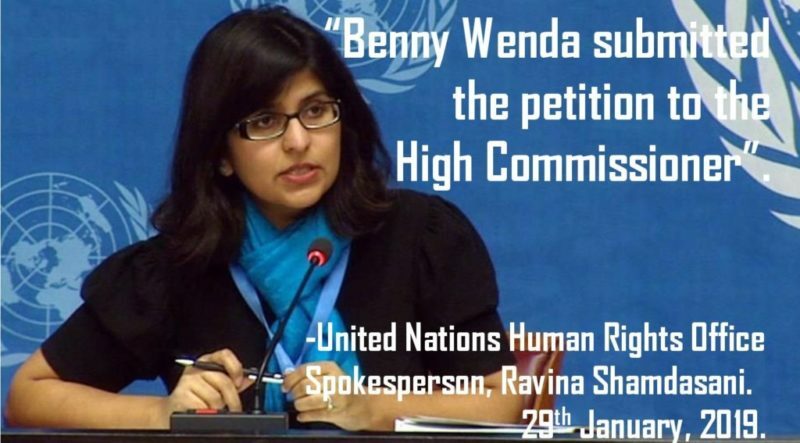 Upon delivering the petition to the United Nations, ULMWP Chairman Benny Wenda stated “To our many friends working in solidarity with the West Papuan struggle all over the world, we thank you for standing with us. You assistance is vital in our long road to freedom. “And to the people of West Papua, thank you. Today is a proud moment to represent your voices – thank you for never giving up and for courageously coming to the streets and flying the Morning Star flag, despite the brutality you face. “Thank you for your patience, your strength and your spirit. Thank you to so many of you for having the courage to sign the historic People’s Petition – your voice is now in the hands of the United Nations. We are making progress, together, in unity.